Dark as hell and completely unpredictable film noir. There’s a pretty good storyline here about murder that comes to the suburbs and effects a family. That story involves hitmen and black comedy and all the kinds of things you would come to expect from a Coen Brothers movie. Only this is not a Coen Brothers movie and director George Clooney can’t help but remind us of that, but putting his own political agenda into the mix. He takes this pretty compelling storyline, where characters are far more mischievous than they seem, and combines it with the dramatic story of a black family moving into an all white neighborhood and being terrorized. The two genres do not fit together well. Especially when it’s really watching two stories that seem like they are part of different movies and don’t have any real connection or purpose for being in the same film. The Matt Damon crime story, which is the central story of the film is pretty great. It’s the way it gets tangled up with the other story, (also a compelling story, just not for this film,) that causes this movie to feel more disturbing than fun. 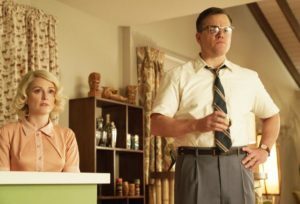 Suburbicon is a very weird movie. It’s got the look of a Coen Brothers film, but the feel of something else. You see, it is not a Coen Brothers movie. It was written, but not directed by them. And it was written by them some years ago, and then shelved and unmade, until George Clooney, (long time friends with the Coens, having starred in three of their movies,) got his hands on it. Clooney rewrote the script, made changes, and then directed it. The result is a much darker film than anything the Coen Brothers have done, (other than, maybe their first movie, Blood Simple.) This is a movie about home life in a rural neighborhood where crime finds its way in and doesn’t exactly want to leave. The film stars Matt Damon, although for the longest time, Damon is nowhere to be found. Instead, we meet every character but him in the opening scenes of the film. 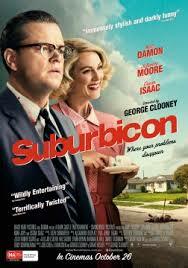 First, there’s an advertisement for the town Suburbicon, showing off the landscape, what the people do there, and the time period. We’re talking late fifties, and it’s a cookie cutter, almost Stepford Wives – like, conservative town. Everyone here is white. And we jump from this ad to real time, where a black family, named The Mayers moves in. The Mayers are met with all kinds of hostility. This happens throughout the course of the movie, and only gets worse as the film goes on, but right at the start, there’s a mailman who can’t believe a black family moved in, and then a town hall meeting. At the meeting, the people of the town are furious with the board of directors, (three men,) for approving this family get a house in the neighborhood. They talk about how the property value of all of their houses is about to go down. They even propose building a fence on both sides of the Mayers’ house so that no one has to look at them. All of this has very little to do with the crime plot that is the central story in this film. In fact, it really has nothing to do with it at all. After that whole big introduction of both the neighborhood and the black family moving in, we see the porch of the house in back of them. Two women sit out there, with a young boy. The women are Rose and Margaret, both played by Julianne Moore. the boy is Nicky. Rose and Margaret are twin sisters. Rose is Nicky’s mother. The women convince Nicky to go over and play baseball with the boy who lives in the Mayers’ house. That’s about the only real connection these two stories have to each other. Luckily, Nicky’s story picks up from there. He goes to sleep that night and is woken up by his father, Gardner Lodge (Damon, finally showing up,) who tells him that there are men in the house. Nicky needs to come downstairs with him. Lodge tells his son that the men are just going to take what they want and then leave. Only the men have other ideas. They toy with the family and eventually use chloroform on all four members. Gardner’s wife, Rose, dies. We see both Nicky and his father slowly recover and we also see Margaret move in and start having an affair with Gardner. Then comes the lineup. This scene is crucial. What happens here changes the course of the film, and what we know or think we know. Without giving anything away, let’s just say that from this point on, we start to rethink characters and their motivations. And we get a real shakeup as far as who the good guys and the bad guys are. Not that we can be positive after this scene, but at least we start to have our suspicions. And the movie slowly unfolds after that, exposing more and more of the truth. At one point an insurance agent shows up and he’s got plans to blackmail our protagonists. This is the Oscar Isaac character we see in the previews, and he’s only got two scenes in the movie, but boy does he make them count. Isaac has his own ideas about the way things work, and he’s not afraid to call our characters out on the way they’ve been doing things so far. It’s tough to call this movie a black comedy, but if it was, than Isaac’s character would be one of the funnier parts. Figuring out the genre of the film is surprisingly tough. Clearly it’s meant to be a film noir style mystery, along the lines of Double Indemnity. And it is also meant to be comedic in the darkest of ways, (the Matt Damon crime story,) but then there’s the story of the Mayers, which is pure drama, and that’s what doesn’t quite fit. Plenty of movies have combined genres before, and there’s nothing wrong with that, only here, it kind of feels jarring. A genre combination of say black comedy and drama, would generally mean that some scenes are a little more funny and some a little more dramatic. Or sometimes both tones come out in the same scene. But what we have here is different. What we’ve got here is basically two different movies in one, that are both at odds with each other. Everything about the Mayer’s storyline is dramatic, and it’s sad and upsetting. There’s nothing funny about any of it. This poor family is terrorized by the neighborhood of racist white people who want them out. First the people harass them in town. When the mother goes to the grocery store, the store owner charges her twenty dollars for each items she wants to buy. Then the people of the town put up the fence on both sides of the Mayers’ house, and start making all kinds of noise on either side of it. And then they start running at the house, destroying the property. If this was a pure drama of a movie, that storyline would be fine. Especially if there was some kind of positive message at the end. Even Mississippi Burning had some punishment for the villains. No such luck here, with this storyline. There’s no message, (other than showing us how terrible things were back then,) there’s no redemption, and there’s no connection to the Matt Damon story. That plot line, about the mystery and murders was pretty great, and it’s a real shame that it got all tangled up with this one. You watch this movie and keep waiting for the two stories to connect, and they never really do. It’s a wasted opportunity.